Spring 2018 might just go down as the season of basics for me. My favorite place to turn for basics? Lately, it’s Old Navy. Unlike its sister stores Old Navy has great quality items for not a lot of money. This is just 1 of the the 5 reasons why you should be shopping at Old Navy too — especially today, when everything is 40% off, no exclusions! No code required, discount applies at checkout. Some of the other items that might look familiar to you include this double-tasseled suede purse and these canvas sneakers. Another reason to love Old Navy? They excel at the classics. 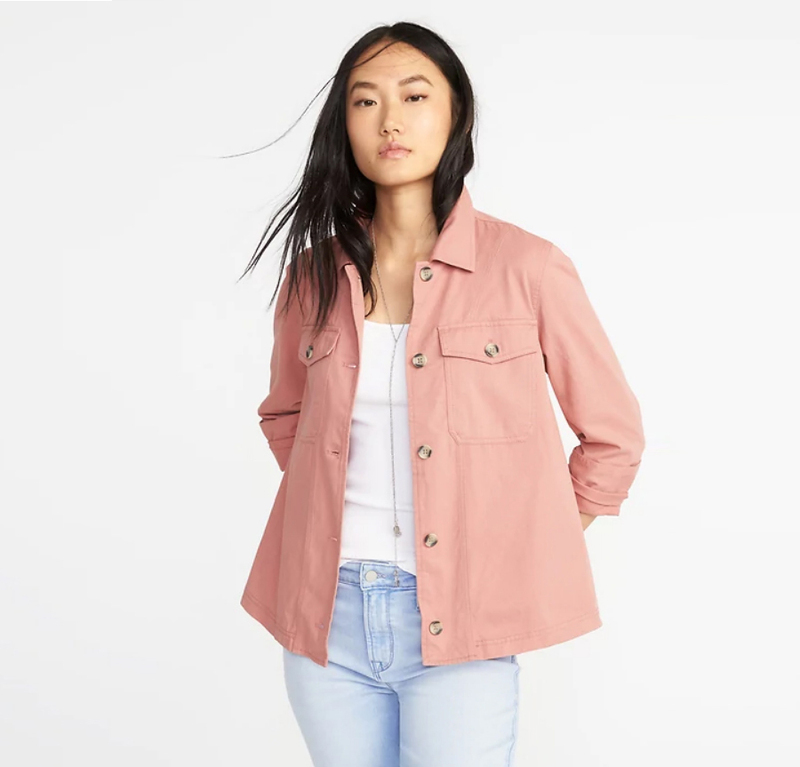 This twill field jacket is something you can find at any number of stores — but often for well over $100, and the Old Navy version quite honestly blows many of those more expensive takes out of the water! For the price of one of those expensive jackets I could buy this jacket in 3 or 4 colors (which ahem, I’m seriously tempted to do). Now, maybe you don’t need this jacket in multiple colors…but it’s such a staple that will never go out of style that I love the idea of buying a few different colors and having them available to me for years to come. This pink color above is ideal for Spring. The blue? Great over a white or ivory blouse for casual Fridays at work, and perfect over a tee shirt for the weekend. The green? The timeless shade we all know and love. 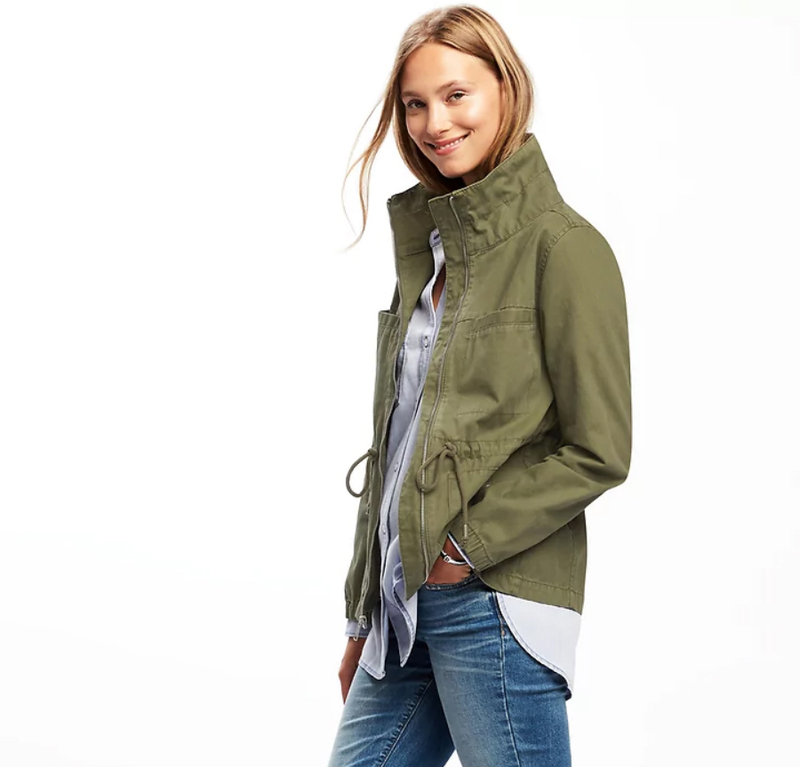 The Twill Field Jacket ($45 + 40% off) is one of several pretty lightweight and medium-weight jackets Old Navy has right now. That’s another reason to shop there — the huge selection! I recently found an amazing distressed denim jacket there and then it was very easy to find several tee and tank top options to layer beneath it. These days when I’m rather rushed for time it’s awesome to have a one-stop shop where I can pick up cute items and feel really good in them. Because their designers think in cohesive collections, it’s very easy to mix different items and even different prints together. So for example, when I know going in that the Sueded Knit Moto Jacket ($60 + 40% off) in lilac is going to look great over this top, this tank in several colors, and about 25 other pieces Old Navy has right now, the purchase goes from a deliberation to a total no-brainer. The final reason why I love Old Navy? Because I don’t have to spend a ton of money there to come away with several fantastic outfits. I’d been waiting (and waiting and waiting) for this 40% off promo to hit with my cart full of mix and match pieces. Now, less than $500 later, more than 10 outfits are on their way to me in my order! I like that whatever my budget I can come away from Old Navy with seriously cute stuff. Here are 3 quick outfit ideas. Old Navy’s Spring 2018 stuff happens to be exceptionally cute. They really hit it out of the park this season with their hues of green, lilac and pink for trend (mixed with some yellow) to go along with the classic pinks, whites, blacks, tans, greys and blues. Below, all my picks for the 40% off everything promo that ends tonight. What will be outfit twins with? See if you can guess what I ordered from this boutique and share your orders in the comments! 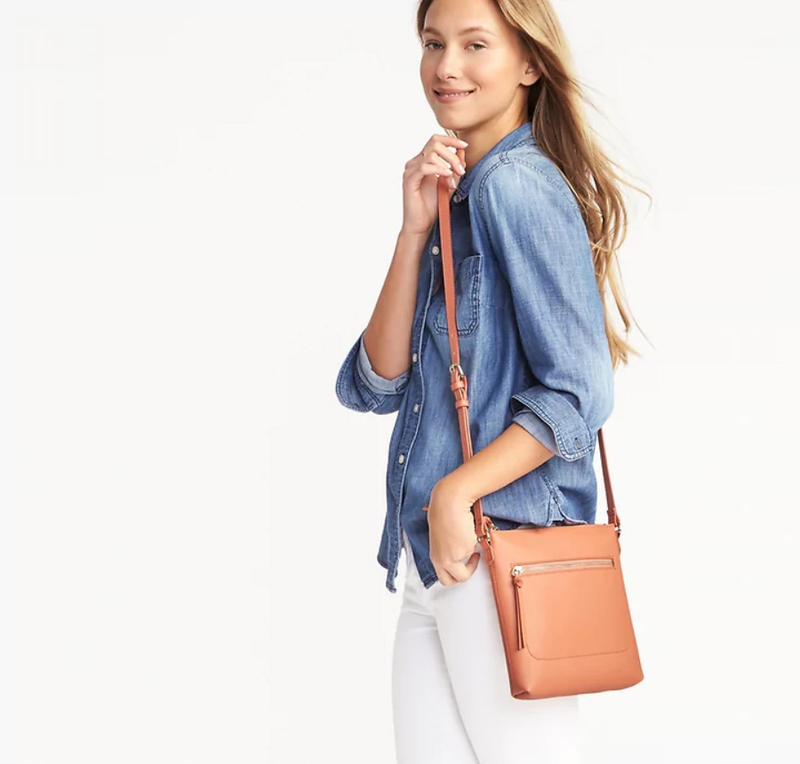 Then, after you’ve shopped your heart out here, check out my picks from Madewell’s Insiders promo, which also ends tonight. Previous Post Is it worth it to be a Madewell Insider? Oh yes. Me too! I think it will be so wearable all Spring and Summer long. Thanks for sharing all your sale picks! Old Navy truly has such great classic pieces! Loving the army jacket. If I didn't already have a camo jacket in my closet that one would be coming home to me. So many cute outfit options! I really love outfit #1, it's perfect!! I've been crushing on some old navy pieces lately! I need to take advantage of these pieces! I love Old Navy because they have the best selection for all different body types. The price points are unbeatable too! 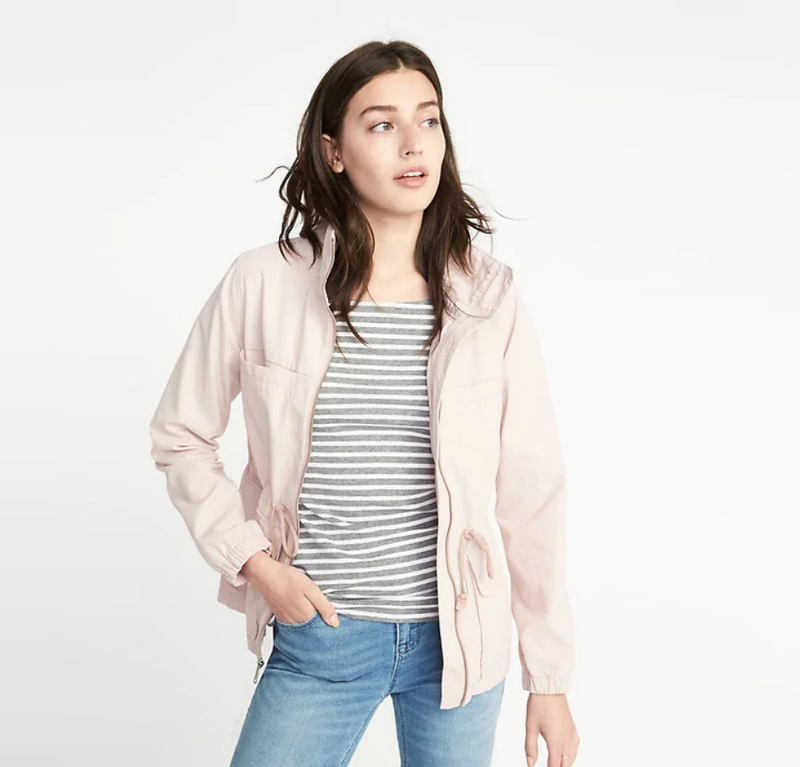 Love these picks, especially the light spring jackets – they are all so perfect! Wow so many great pieces! I havent checked out old navy in ages! Will def have to go check them out! I LOVE Old Navy! They have the cutest seasonal buys – your picks are all so cute! I can never pass up a good sale! Old Navy has really stepped up their games! I love all of your picks for spring! The pink field jacket has my name on it!! Ahhh I need to stop in there! So many great pieces! Old Navy always has the best budget-friendly finds!